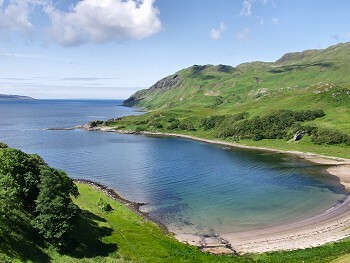 After a too short visit it was time to leave the Isle of Mull again. 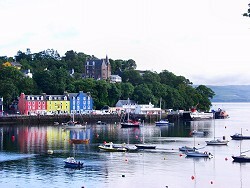 But I had a reservation on the Isle of Skye for the evening already, so I boarded the ferry from Tobermory to Kilchoan on the Ardnamurchan Peninsula. On Ardnamurchan I had planned to visit the most westerly point of the British mainland, Ardnamurchan Point with its famous lighthouse. The six miles from Kilchoan on the single track road were quickly covered, luckily there wasn't much traffic and I didn't have to use the passing places often. 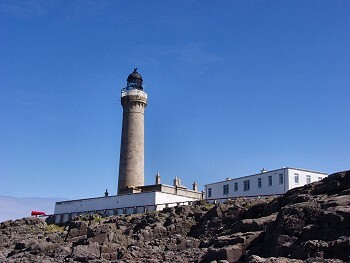 The lighthouse is now fully automated and the keepers house has been converted into a very interesting museum about the history of lighthouses in general and Ardnamurchan Lighthouse in particular. It was completed in 1849 as one of many built by the Stevenson family. 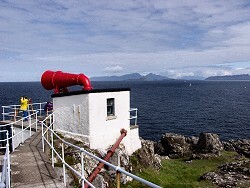 The fog horn is not functional any more, but provides an excellent platform for whale and dolphin watching as well as excellent views to the Hebrides and the Small Isles. Below a view north, with Muck and Rum on the left (Muck in the front, Rum in the back), Skye in the middle and Eigg on the right. The drive back gave me several fantastic view, some of which you can see below. 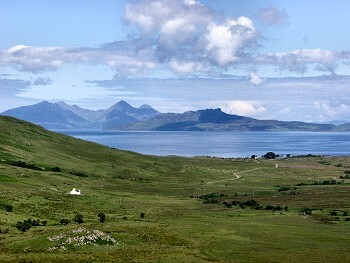 First a view back to Skye and The Small Isles on the left. 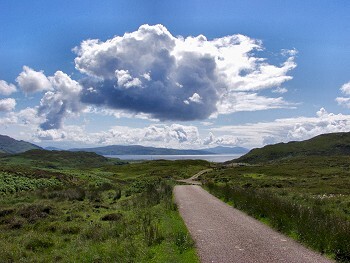 Next a view over the Sound of Mull on the right. 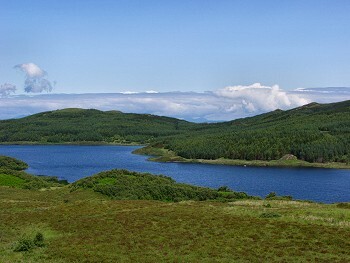 Then a view of Loch Mudle on the left and a view of a small bay near Ardslignish on the right. 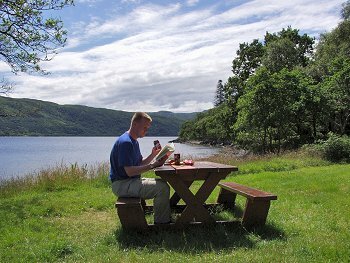 I took my lunch break somewhere at Loch Sunart, very nice just to sit there in the sun and read. A light breeze kept the midges away, what more could I ask for? 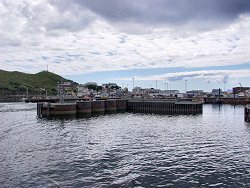 May be a little bit more time, as all too soon I had to leave again to continue to Mallaig to catch the ferry to the Isle of Skye. I made good progress on the "Road to the Isles", allowing me to take an earlier ferry than originally planned. Which in in turn allowed me to arrive at Kinloch Lodge earlier. 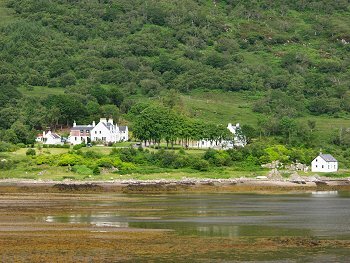 Kinloch Lodge is overlooking the Sound of Sleat towards Glenelg and Knoydart. From my room I could see the Cuillins, a very nice view. And this page was written in the lounge with a cup of tea and some very nice shortbread, occasionally looking out of the windows over the water.